Blanketweed is a scourge to many garden ponds but you could be staring at clear water with the help of this frog and environment friendly Extract of Barley Straw. Supplied in 250ml bottle, the Extract of Barley Straw is perfectly safe to use around fish and plants thanks to the absence of any synthetic chemicals and artificial pesticides, and each size of Extract of Barley Straw bottle contains detailed dosage information for both the cure and prevention of algae and blanketweed. However we recommend dosing 125 mls per 1000 gallons as an initial dose followed by 20 - 40mls per week. This ensures a background level is maintained within the pond to ensure that it works effectively. If using Extract of Barley Straw as a preventative measure, we recommend starting to dose it at the beginning of March at a rate of 20 mls per week. Please note that the above dosages are given as a guideline, as all ponds and all algae are different and respond differently to treatment. Extract of Barley Straw is a totally natural product, so it may take a few weeks before you see the full effect. If you are not satisfied that it is working quickly enough, you can add more as it will not harm your fish, pond plants, wildlife or pets. I have used this product for 3 seasons now, it does keep blanket weed under control, but doesn't eliminate it. But does stop the water going green. I found it more effective than the straw balls, and definitely not so unsightly. This does take a bit of time to work (hence the 4 stars) but is worth the wait as it is so safe for wildlife. We have a large pond and this will be the third dose we've given it but it is definitely having an effect. I would highly recommend. What is Ecopond Extract of Barley Straw? 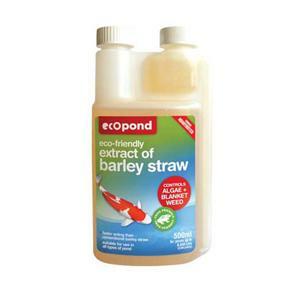 Ecopond Extract of Barley Straw is a liquid version of the barley straw bales sold to treat algae in ponds, but because it is a concentrated liquid it works faster and is simpler to use. It acts as a natural algicide, killing the algae by breaking down the cell wall, rather than by removing the nutrients on which the algae feeds as some other products do. We recommend dosing 125 mls per 1000 gallons as an initial dose followed by 20 - 40mls per week. 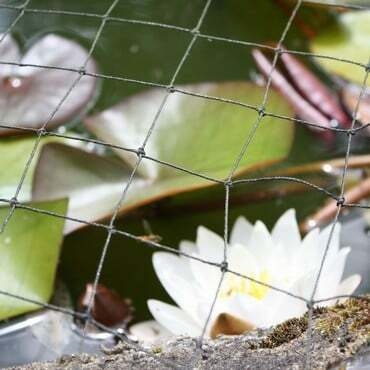 This ensures a background level is maintained within the pond to ensure that it works effectively. If using Extract of Barley Straw as a preventative measure, we recommend starting to dose it at the beginning of March at a rate of 20 mls per week. Please note that the above dosages are given as a guideline, as all ponds and all algae are different and respond differently to treatment. Extract of Barley Straw is a totally natural product, so it may take a few weeks before you see the full effect. 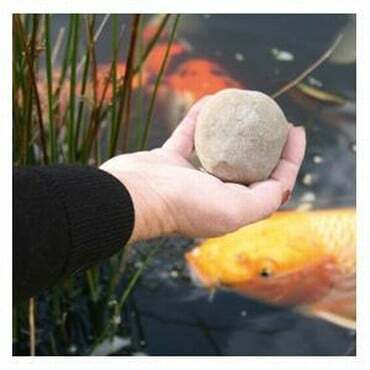 If you are not satisfied that it is working quickly enough, you can ayou can add more as it will not harm your fish, pond plants, wildlife or pets. Its regular use will help control blanket weed algae & green water. As it is totally natural and safe to use you can be confident that precious fish or plants will not be affected by it. Is there any anything that stops Ecopond Extract of Barley from working? It is best added near to a re-circulating system or pond pump to ensure it is well mixed, but otherwise, it can simply be sprinkled across the surface of the water. The 250ml, 500ml and 1 litre bottles have built-in measuring chambers.